One of my absolute favorite side dishes to make is a southwest style quinoa and beans. Do you like quinoa? It’s so healthy for you! I was kind of afraid of it at first, not knowing exactly how to make it. But it didn’t take long for me to absolutely love it! I will be honest when I say that my kids are not as thrilled as I am about this. But many people are who I have shared it with so thought it was time to share it with you too! Disclaimer: I love to cook, but really do not like measuring things. So I never can truly duplicate a recipe. I do come close most times however, so I will do my best to share with you! 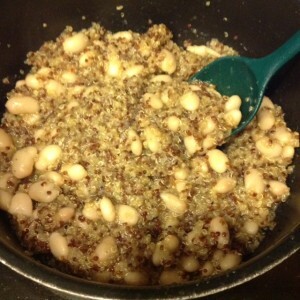 3/4 cup Quinoa – I like to get the organic red or white for this. Sometimes I do a little of both, which makes the dish look pretty. Broth – I like low sodium chicken broth but if you are keeping it vegetarian, use a good veggie broth. If you use water it will need extra seasoning. Beans! – I have used white (pictured), pinto and black. I love to buy dry beans and cook them over night in broth and water in the crock pot. Dry beans are healthier and much cheaper. I make a ton at a time and we eat them in various recipes during the week. Beans are really healthy protein too! And usually a kid favorite. That said, take 1/4 to 1/2 of an onion, chop it a bit and then blend it up in a magic bullet or other blender of your choice with about a tablespoon of garlic (I save time by buying this in a jar to keep in the fridge), some broth or water. Blend till smooth. Heat the mix up on the stove with about a tsp of oil. I like using coconut oil. Cook that down a bit while you wash and drain your quinoa. Toss Quinoa in pan with onion mix and cover with broth. Add in seasonings to taste. Go easy on the salt but in my opinion you can’t have too much cumin. Bring to a boil. cover and simmer for about 20 minutes until liquid is absorbed. Toss in beans. Use 1-2 cans if you are using cans or as many scoops as you like if you are using dried cooked beans. Yum! Let beans warm in dish and serve! Delicious flavor. Healthy too! Thanks for stopping by! Leave a comment to share what you think of this recipe or if you’d like to try it soon! ← Shaklee Global Conference, New Products & Freebies!